towards the +55mW total of 532nm. Great price, excellent build quality, measured over spec at 59mW. Dot is visible at ~100' in broad daylight, beam is visible inside dimly lit rooms. This is about as bright as you can get comfortably. Inside completely dark rooms the dot will light up the room and is almost too bright to look at. 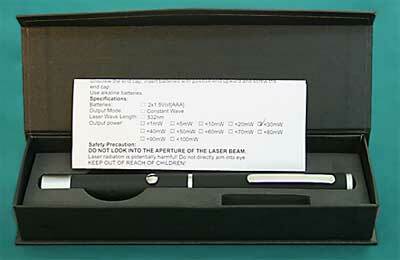 I would recommend Optotronics to anyone looking for a quality laser pointer. I am one of the telescope operators at the Houston Museum of Natural Science/George Observatory. Very impressed with quality and intensity of my 55mW laser which was actually rated at 58mW. Good service and fast delivery. My only complaint, and this is really minor, is that the pen pocket clip came off and will not stay on. This is not an issue for me because I keep it in my pants pocket anyway. Every Saturday night is public night at the observatory and my very bright and intense Optotronics laser pen is always a crowd pleaser. I plan on buying another in the near future.